It doesn't happen often enough where a comic book series, a crossover especially, gets better as it continues. There's usually a lull around issue three or four that is either heavy in exposition or deviates from the action to develop the characters. 'Aliens/Vampirella' #3 balances all these things and keeps the story moving forward with intelligence, suspense, and superior pacing. 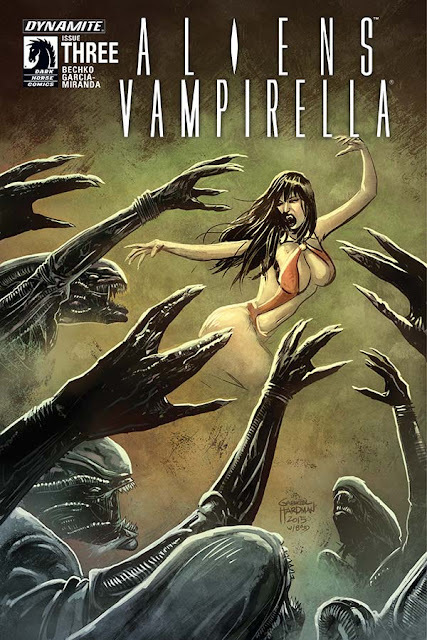 Vampirella and Lars are still trapped in the underground base being hunted by xenomorphs. It's a tension-filled series of near-misses that gives this comic its horror bonafides but Corinna Bechko doesn't rest on those laurels. She creates moral dilemmas above ground. The orbiting crew is staying put while the quarantine is in effect but understandably Lar's wife, Sarah, wants to know what's going on down there and if they're in danger. Meanwhile, the crew on the ground in the new base is getting nervous about what they've seen from the video footage and are considering containing the threat with Lars and Vampirella still down there. 'Aliens/Vampirella' is more than just a showcase for two different properties. In fact, this fully realized universe belongs completely to the 'Aliens' franchise and Vampirella just happens to be guest starring. That's not to say she is isn't vital because it's quite the opposite. The discovery of Nosferatu is what brought her there and now she's the key to revealing more of this old base if they survive long enough. Bechko has taken the best elements of both franchises and blended them seamlessly into a taut science-fiction horror thriller. Javier Garcia-Miranda does wonderful character work and the xenomorphs are especially terrifying. The layouts are efficient, propelling the action forward without wasting a panel, and Garcia-Miranda's splash pages are perfectly timed. The pacing is quick but not rushed with each scene succinctly rendered in economic panels. The story flows well from scene to scene. 'Aliens/Vampirella' #3 is a quality series that fans of both properties will enjoy but more importantly anyone can jump into and share the thrills of this great crossover. Bechko and Garcia-Miranda have created more than just an homage to the 'Aliens' universe but have carved out a worthy chapter all their own.